Best way of keeping them sharp when fishing? You may find some waters your hook will go blunt just being cast into the lake, and sharpened hooks can be worse for that! Anything can blunt a hook, snags, running over gravel, sticks, twigs or stones, or even sitting in silt. Personally, I don't sharpen hooks, I use makes that are sharp enough out of the pack to bring tears to the eyes. If the brand is not that good, then find a brand or make that is. 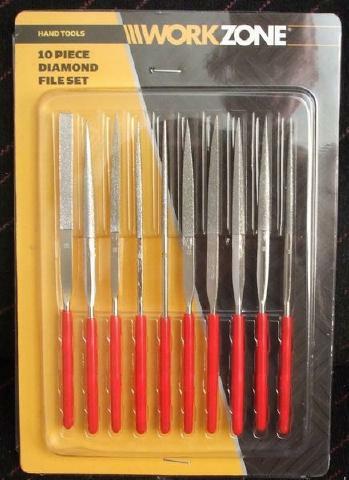 I use a Diamond Needle File. I use a hook doctor just to touch up the hook during the session, Jim Shelly is a big advocate of sharpening hooks with a file and vice, he has a FB video where he shows how he likes to use the tools, reckons it is one of his best edges resulting in more fish. Says in the video hook sharpening is part of the tutorials he gives. a jewelers vice like the one below is also cheap as chips. I use a Eze-Lap diamond file. Its not expensive, works great, and doesn't take up much space at all in my tackle bag.